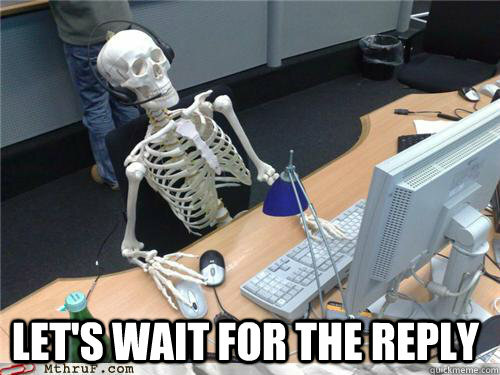 MSM going gaga about latest news about the Pope. And the kid who came rushing over to him. 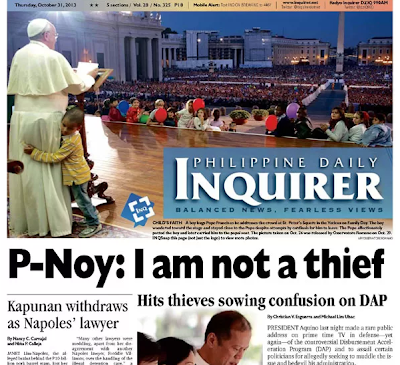 Look at how the Inquirer splashed the photo in today's front page. Not that I am saying it is a bad thing, ok? I am just wondering why it did not happen during the time of Pope Francis' predecessor. Maybe because it is Benedict. PS: The banner story made me laugh so hard. Did I deny Vatican II. NO! But some people claim that I do, which I don't. Some people claim I am a "secret SSPX supporter" which I am not. But this is who I am, and to quote Cardinal Pell who responded to the question "so people like Fellay have completely misread Pope Francis?" Yes, it is a gigantic misreading! In actual fact, the Lefebvrists – many of them – have misread the situation for decades. It was to Benedict’s great credit that he tried to reconcile with them, but they didn’t respond. Now the Church today accepts the Second Vatican Council. You don’t have to accept every jot and tittle of it, but it is part of Church’s life now, there’s no way around that. BOLD LETTERS are mine for emphasis because those are EXACTLY my views. Now let the criticism of YOU-KNOW-WHO start. More warnings for a relic collector who is scamming people! emm sir Pedro, something else you should know about MP....besides sa pagtatago ng relics. Em, he has been "promoting" the canonization of Blessed Ma. Teresa of St.Joseph, by "veneration" and distributing holy cards and information about her (take note the holy cards have relics in them and he recieved the materials from the Sisters in the Netherlands without cost at all), however...recently there have been complaints sent to the Sisters in the Netherlands saying M___ P___ has been charging people for veneration of relics, and for the holy cards of Blessed Mother Teresa, he charged 200 pesos for each card. Do we have an idea why this guy caused so much a controversy in the Church? Why he taught of making a a new religion while constipating in his toilet? Postulators of these blesseds must be warned. The name of this scammer must be sent immediately to the Archdiocese of Manila who has jurisdiction over MP. And his parish priest must be warned. Anyone who would like to volunteer to email the postulators of all those who he contacted? This guy doesn't know that he is committing a terrible sin of SIMONY. The cardinal prefect for the Causes of Saints already spoke up against it. And I have blogged about it too. I heard Mass at Don Bosco Makati today and especially liked the Gospel for today. The Gospel is about the mustard seed and the leaven as likened by Christ to the Kingdom of God. I know I have rubbed people the wrong way, and I know that I had been too harsh in how I said my piece of mind. Sorry, if I hurt people. But the truth can sometimes hurt, and I am one old guy who will never ever be a member of the Church of Nice. Though how insignificant I may be, though how small like a mustard seed the blog is, I am consoled that my work generates the debate that it intended to start. Priests are talking. Lay people are asking. The Chancery is now wondering. I am not the mustard seed or the leaven in the Gospel. I do not claim it. I'd let the readers of the blog see for themselves if my work has made the dough rise, or if the seed I have sown has grown and the birds of the trees rest upon its branches. It is you, dear readers, who tell me to "Go on!" "Don't close the blog!" "I have been enriched with what you wrote." It is only you then, who'd tell me if it is about time to stop. My health is failing me and I am not getting any younger. I suffered what was diagnosed as a mild stroke and I will be resting for a while. Thank God that I have other bloggers who would be contributing to the blog. They will be helping out. Are they priests? Seminarians? 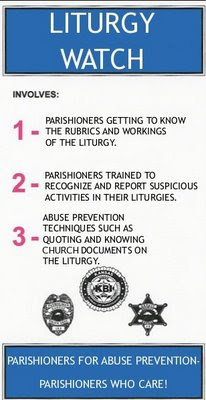 Laity? The image of the Our Lady of the Holy Rosary was placed in front of the altar of the church because it is the Rosary Month and residents would pray the Rosary every dawn and at 6 in the evening. Residents immediately linked what they called a “miracle” to the earthquake that hit Cebu and Bohol last October 15, which killed over a hundred and destroyed buildings, mostly decades-old churches in Bohol. Quiroga believes the “miracle” is Mother Mary’s message to Filipinos to have faith and believe in God. Parish Youth Coordinating Council (PYCC) president Russell Guardina, 21, said that it is not the first time that they noticed the head of the statue of the Virgin Mother move its head. Guardiana’s statement was corroborated by Samantha Delarita, 19, the PYCC secretary. SPO1 Jared Llenos and PO1 Madrid Aparre said that early yesterday their station received a call from Alcantara Vice Mayor Beatrice Caburnay requesting for police assistance at the church. Elizabeth Tabanaw, a resident of the nearby town of Moalboal, said that upon hearing the news of the “miracle”, she, together with her relatives and her baby, went to the St. Augustine Parish to check if the news was true and at the same time, to pray. “Mga around 1:00 p.m. mi naabot taas kaayo ang linya naabot na sa gawas sa church unya 3:00 p.m. na wala pa gyud mi maabot sa birhen,” she said, adding the movement of the head of the statue was indeed a miracle. Fr. Herardo dela Victoria of Ginatilan said he also went to the church upon hearing the news. When asked if the movement was a miracle, he said this is still subject for investigation. However, he added that personally, he thinks that the movement is a message for Catholics, reminding them of the Holy Mother’s mandate. Msgr. Binghay said it is understandable for people to think that the alleged movement of the image was a miracle because of the disaster that recently hit Cebu and Bohol. He added that this may be taken as a “subjected perception” caused by the fear of the people of the recent disaster, especially with the continuing aftershocks. But Binghay said that if the reported “miracle” is true, it would be a wonderful sign. For now, however, Binghay said there is a process that needs to be followed and people need to be objective while waiting for the report of the parish priest. Determining miracles follow a rigid process in the Church. Yeah he speaks like that. That's Amen and Amen. Maybe African twin saints. I don't know. While Filipino Freethinkers, bunch of brats who'd blame all the bad things that happened to them and all around the world to the God who did not heed their prayers, or what they actually meant was the God who does not follow their bratty and bitchy whiny wishes, are all dismayed that a major disaster that hit Cebu and Bohol, and destroyed the historical churches and cost lots of human lives cannot even dampen the faith of the Boholanos and Cebuanos. Maybe they need more load for their broadband for them to continue their attacks against the Catholic Church. No surprise there. RH was made into a law and their financial sources have stopped sending them money. Now that is their god! Made of elastic, no reusable rubber! PS: To the Boholanos out there. Watch out for Teletubbie. He'd pose near that statue. Wear a veil and imitate the pose of the Virgin....then he'd post it on Facebook. We all know that active participation has been in the Vatican II document Sacrosanctum Concilium derogatively called Sako-sakong Kutsilyo. But to ask godparents to lay their hands on the one being baptized??? Whoever told the godparents to lay their hands on the girl while she is being baptized needs to have to go back to school! Whatever supernatural thing did that to the child, huh? Nothing. Just feel good thing! All courtesy of the Church of Nice! Liturgical abuses like those exemplified by the Misa ng Bayang Pilipino aka Chupungcan Mass are expressions of the evils of relativism! No rules. All depends on the whims and caprices of the liturgist. These liturgists, like Fr. Genaro Diwa, act like dictators. They order people to follow their liturgical creations even if they are not approved by the Holy See. They are their own holy see! They are their own authority! And once you even give a slight hint of protest to what they do, it's the dog house for you, boy! No lap dog privileges nor would you be ever accepted to sit in the PPC or Worship Committee meetings! It's parochial limbo for you sonny boy! Even if dictatorship of relativism was defined in a different way, the way these liturgists act makes you think that they are dictators of liturgical relativism. No rules. No rubrics. Just their diplomas and titles and affiliations. 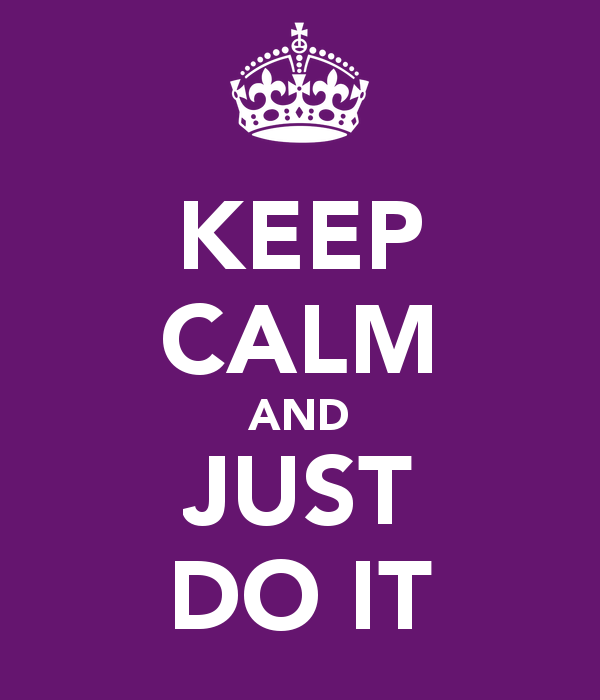 And tell you to do this! And they think it is a game. 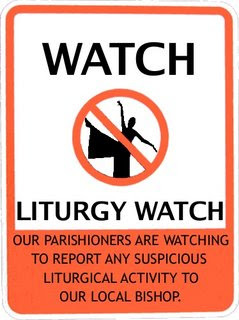 LITURGICAL ABUSE IS A SERIOUS MATTER!!! Filipino Freethinkers will never find an answer to this! But they will certainly find the answer that NO ONE created that. I have received this via email. Did this really happen in Cebu? On the day after His Holiness Pope Francis consecrated the world to the Immaculate Heart of Mary, while commemorating the Miracle of the Sun at Fatima, hopefully contemplating the yet unfulfilled request of Mary to consecrate, with all the world's bishops, Russia to her Immaculate Heart, and to release the Third Secret, lest God punishes the world with a great chastisement, a miracle occurred in the Philippines. Yet, the most profound sign came from the most visited Marian Shrine in the Philippines on the island of Cebu, called Mama Mary shrine. There is a large, miraculous statue of Mary in this shrine, that has cried and cured many pilgrims. In the same church there is another statue of Mary, that appears to be Our Lady of Fatima. It has a base with the word "Portugal" on it. This base is continuous with the statue. They are one piece. The base cannot be detached from the body. Otherwise the statue would be broken into two pieces. Here is the great miracle, which seems to be a message, a warning from Our Lady of Fatima. Right after the earthquake, pilgrims noticed and cried out in alarm that this statue had changed. Mary was now facing the wall, with her back to the people. But, the base itself, molded to the body of the statue, was still facing forward with the "Portugal" inscription! I will try and upload the pic asap (not working from my phone). Our Lady of Fatima, pray for us! May Pope Francis and the world's bishops do as Our Lady requested. Anyone of our friends in Cebu want to confirm this picture and story? UPDATE: 7:32PM. Here is the original post of the one who took the picture of the statue of Our Lady of Fatima via her Facebook account. The post is in Cebuano. Thanks Patrick! Anti-TPC: Am I against the Novus Ordo? Well some "Rad Fan", tried Googling Chupungcan Mass. Of course you won't find it! I coined the term and it is for TPC purposes only! He even declared that I am against the Novus Ordo. 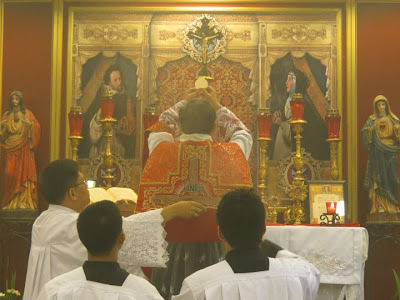 No wonder why I posted about celebrating the Novus Ordo well here, about the correct translation here, about why priests must be well vested for the Mass here, about celebrating the Novus Ordo ad orientem here, how I even sent photos to the New Liturgical Movement website about the canonical installation Mass of Cebu Archbishop Jose Palma, of course done in the Novus Ordo, without the caracol or the Sinulog dance done in the Mass, unlike the caracol done in Imus, and Manila, why I am against Communion in the Hand...Of course why would I be against Communion in the Hand for the TLM? Duh! Of course it only happens in the Novus Ordo! It looks like I have critics from both Chupungcan, makaDiwa wings and the SSPX wings...and the die hard fans of #ULTIMATE You-Know-Who. This is not a war of personalities people! I am for the solemn celebration of the Novus Ordo and the Traditional Latin Mass, no liturgical abuses, no additions, all according to the approved liturgical books of the Holy See, intiendes? Maybe the Japanese goat thinks that this photo I posted is the Traditional Latin Mass. It's the Novus Ordo being celebrated by the then pope. He is a staple of EWTN. I especially loved his sermons for the Good Friday Liturgy. Rest in peace Fr. Pablo! And here is the video announcement from Michael Voris and his interview with Fr. Pablo. Remember this "Roman Catholic" priest? No not Michael Jordan or Michael Jackson. Missionaries of Jesus, the congregation he founded as a break from the CICM which he was provincial at that time. BREAKING NEWS!!! Rome approves Misa ng Sambayanang Pilipino! We have received reports from the supporters of the Misa ng Sambayanang Pilipino that Rome has given its approval for the MSP to be used for the Philippines! Can you read it for us sir? Meanwhile, the Maryhill School of Theology has set up a hotline to await the much needed call from the Holy See about the approval, even for certain conditions for the public celebration of the MSP. Let's get some updates from the Hotline Center. Who needs Rome approval anyway? The MSP was described as "the inculturated Eucharistic celebration for the dioceses in the Philippines, communicates to the Filipino Catholic faithful the spiritual and doctrinal wealth of the Roman Order of the Mass with the use of language, gestures and symbols culled from the Filipino pattern of thought, speech, behavior and cultural values. 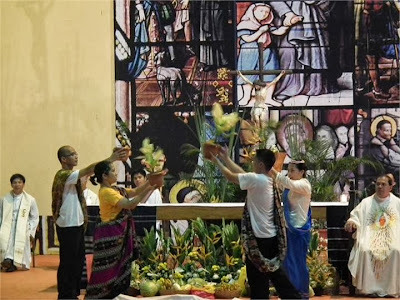 The Misa ng Bayang Pilipino offers the Filipino faithful a kind of worship that reflects their culture and that which they can call their own." Not mandated by Vatican II. Can you see anything in Vatican II that says we need an inculturated Mass? Nada. Like the skeletons above, the MSP is DEAD. It is not approved by Rome. And as long as it is not permitted by the Holy See, it MUST NOT BE CELEBRATED. "Oh TPC! You are so authoritative! Why can't we not worship as we please? As the Holy Spirit leads us!" Then why call yourself Roman Catholic if all you care about is what you "hear" and what you "feel"? Why swear obedience and loyalty to the Bishop of Rome when all that matters is your obedience to the Archbishop of Manila who is ill-advised on matters pertaining to the Liturgy? This Mass is NOT ROMAN CATHOLIC, and it is not even permitted to be celebrated! Inculturated? They did not even include the other Muslim and Pagan tribes' cultures in the Philippines. Pure invention of the master of inculturation, Fr. Anscar Chupungco and his minion, Fr. Genaro Diwa. Pray for the eternal repose of Fr. Anscar. He left a lot of trouble. And pray for Fr. Diwa. He is loose canon. 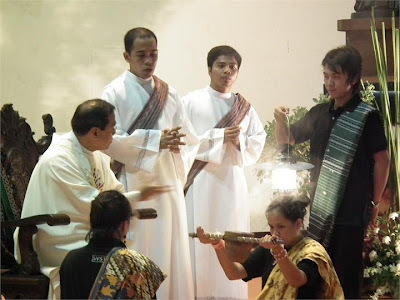 I have always blogged against the Misa ng Sambayanang Pilipino (MSP) and have often said that this is an illicit form of the Mass, a Mass that is not even envisioned by the Council, but a Mass that Filipino bishops and liberal theologians and liturgists have tried to shove down our throats, demanding that we shut up and just obey. What a way to demand obedience when they themselves have openly defied the Church for making us worship with a manner not recognized by the Holy See, with a manner not Catholic. Yes folks, this is not just an issue of authority. It is an issue of identity. Catholics all around the world worship using one form of the Mass before Summorum Pontificum was released, making the Traditional Latin Mass available to those who are attached to it. And so the Holy Father, Pope emeritus Benedict XVI, defined that there is still one Mass, with two forms, or expressions, the Ordinary Form, or the Missal of Paul VI, and the Extraordinary Form, which is the Missal of Blessed John XXIII. 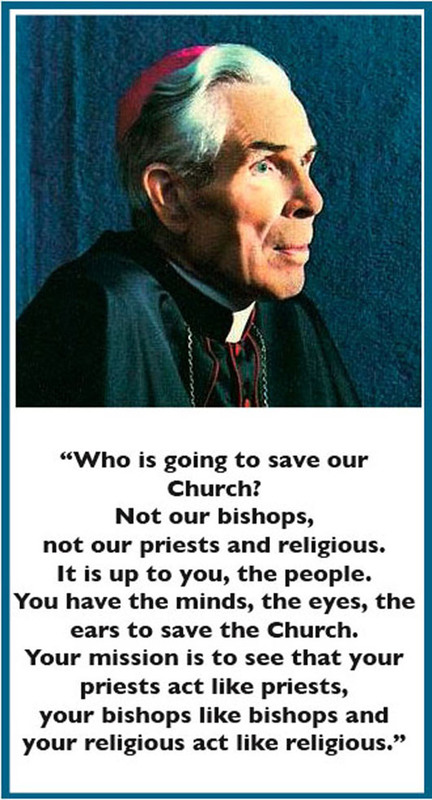 But Filipino bishops and those tied to the leash of the liturgist the late Dom Anscar Chupungco, osb, and his minions, have continuously forced us to worship in a manner foreign to us, the MSP. As you will read in the introduction in the Missal for the PCNE's MSP, all evidence points that this Mass did not get the approval of proper authorities. So supporters would ask "Why would we even ask Imperial Rome for approval? We pray according to the promptings of the Holy Spirit!" "Oh really? Promptings? That is why we need to have guides for the Mass? Why Rome? So who do we need to obey? YOU? Puhleaze!" As you will read in some of the comments in this post and this post, many are SCANDALIZED. I guess not even the scandal that this "mass" created can even make Cardinal Tagle cry, even though how easily he cries as he admitted. Happy days are back again in Manila. Kumbaya! Strum the guitar, and beat the drums! We are more Protestant than we are more Catholic! When we lose our sense of identity as Catholics, when we become too mushy and too accommodating, when we think more like Protestants than Catholics, what do you expect we'll become? And what a perfect way to cause scandal and make people lose their faiths, no? 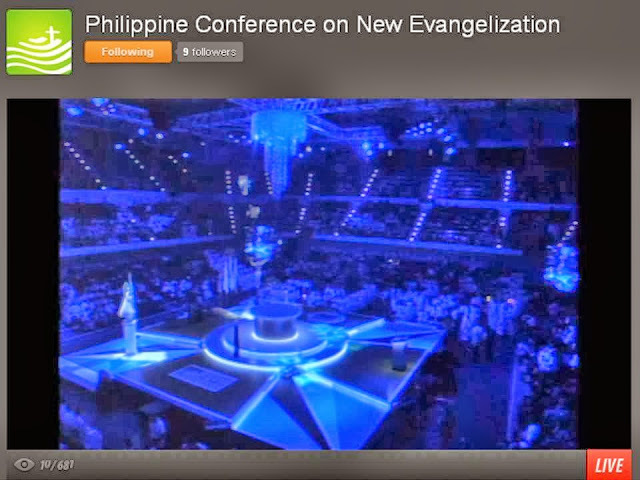 At a conference named "Philippine Conference on the New Evangelization". Those in UST, I am very sorry for you. I am sure the PR gangs of Katipunan and the minions surrounding the cardinal all bullied you into obedience for this horrendous way of saying the Mass. Misa ng Samabayang Pilipino, anything but a Mass, anything but Filipino. SIMPLY SCANDALOUS! Oh...and idiotic as well. Or the next time you know that the MSP will be celebrated. Attend! Then when the entrance procession starts, leave! The "Mass" has not started and you are not sinning. If you even participate in this kind of "mass", you'd be sinning more. PS: I am pretty sure blood pressures are rising and eyebrows rising. Hello Professional Chupungcan Altar Servers! Of course, you'd be disappointed by this post! You'll lose your position of authority, fame and fortune if we do away with the MSP! Fr. Chupungco did a lot of harm for the Church. He did. Pray for him. NO. This ain't the show. How you can even convince lukewarm Catholics to spread the Gospel with a set-up that looks more like a game show than a Catholic sanctuary is beyond me. We have lost the sense of the sacred. SO.............do you want to phone a friend? "Hello, I have just witnessed a grave liturgical abuse committed...."
"We have here 6,000 strong missionaries..."
NO, not the cheering for the caracol. Can you see how happy the gang is for the illegal Misa ng Sambayanang Pilipino? A rite or "expression" or version of the Mass NOT APPROVED or NOT RECOGNIZED by the Holy See, a prerequisite before it can be celebrated? The Chupungcan Mass is ILLEGAL. Then why are they celebrating it even though there is no recognitio from Rome? But when it comes to the approved Extraordinary Form of the Mass aka Traditional Latin Mass, the Archdiocese of Manila is NOTORIOUSLY against it, all for the stupid reason of....well, just read it here. And read how it was analyzed and decimated. Post it here, not in the FB page of TPC. Clue: Have we really lost respect for the sacred? You are led by liturgical experts who are so over their heads! Why would your science not tell us when an earthquake will strike? They cannot even explain through science how this happened and instead blamed GOD for the destruction and death. Yeah, I guess if they get stumped and humiliated, it's God's fault. 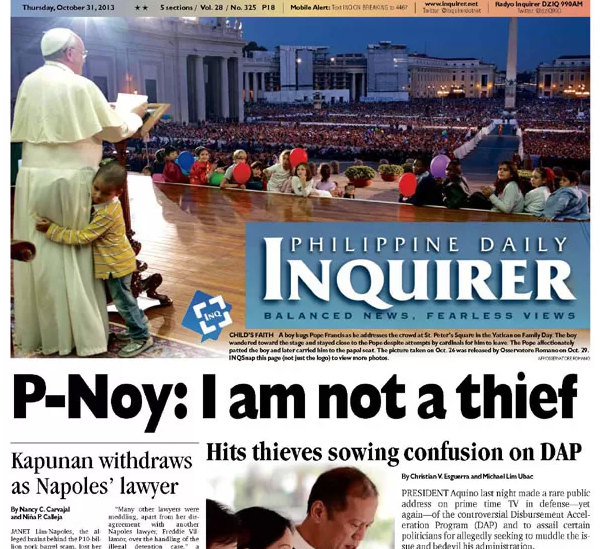 Maybe you should start blaming Gloria Arroyo too no? 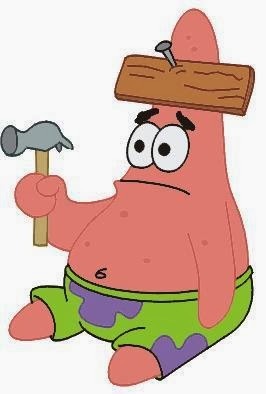 Or maybe ask this genius here why he can't find a solution to his own problem. PS: I have stirred a hornet's nest but I brought along my pesticide. Ha! Since they are all about the BRAIN. And since they are so very good about logic, science and mathematics. Why that statue did not suffer any damage? Why did that glass frame remained undamaged? Let' see you use your brain for this one. Manalo belivers aka INC members, claim that the earthquake destroyed Catholic churches in Bohol because these are houses of worship for idols. Perhaps they forgot to see that there were other buildings not of the Catholic Church that was destroyed also. PLEASE stop making photo montage of damaged Catholic churches! It is creating an impression that the only buildings destroyed are those associated with the Catholic Church! There were other buildings destroyed as well! Duh! Why am I even answering these people. To start with, they are with the INC. Should you even be surprised they have that kind of logic? Something the Iglesia ni Cristo will definitely NOT do! Open the doors of their drabby chapels to shelter evacuees and poor people. Guinness will never have a World Record for this. Thank you for doing the medical mission yesterday. You showed your real colors! As I have posted on my Facebook account: "The INC has found the solution to bloat the numbers for their "public show of force"
The 7.2 earthquake destroyed this centuries old church. I have fond memories of this church. Please pause for a moment and pray for the people of Bohol. This is the time we really need a sensible medical mission. Not like what we had yesterday. Then why the heck do we even dress up our kids as evil creatures on All Hallows' Eve??? 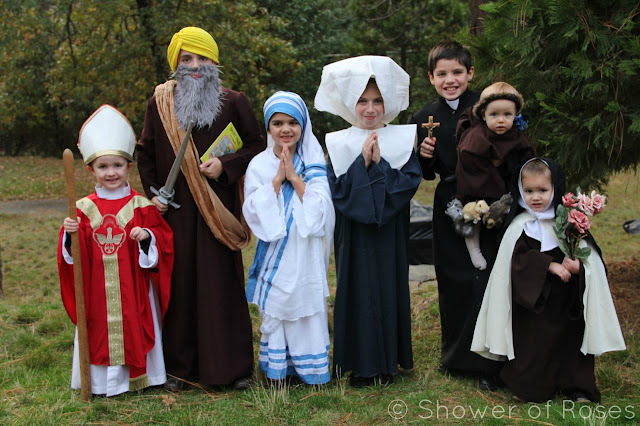 MANILA, Philippines - Roman Catholic dioceses can start a new tradition, a “march of saints” for Halloween, with children going around the neighborhood dressed up as their favorite saint, a group said yesterday. “There is a growing concern among Christians, in general, that the modern celebration of Halloween threatens to take over the proper observance of All Saints’ (Day). Halloween’s powerful commercial appeal has largely succeeded in trivializing and even glamorizing evil, the occult, and superstitious and pagan practice and beliefs that are incompatible with the Christian faith,” the Prayer Warriors of the Holy Souls (PWHS) said in a statement. The group is a national association of Catholic lay faithful and a member of the Sangguniang Laiko ng Pilipinas (Council of the Laity of the Philippines). The group said many Catholics have become apprehensive over the thought that Halloween would replace the observance of All Saints’ Day on Nov. 1 and All Souls’ Day on Nov. 2. The march of saints “is a tradition that has the potential to draw people’s attention away from glamorized symbols and personifications of evil and direct their focus on the heroic lives of the saints and their victory over evil by the grace of God,” the PWHS said. The group said the march of saints would distract people from participating in “trick or treat” neighborhood visits and Halloween parties. Those participating in the march would also be in costume and could bring their own props as they go around the neighborhood, the PWHS said. I know some "guys" who dress up and pose like saints all year round. As a parent, would you even find it fun to see your child a creature of evil??? I'll be on the watch for my grandkids. Spanish Martyrs beatified! New Pinoy Blessed! The Spanish persecution of Catholics happened during the time of the young Fr. Josemaria Escriva. It was shown in the movie "There be dragons". 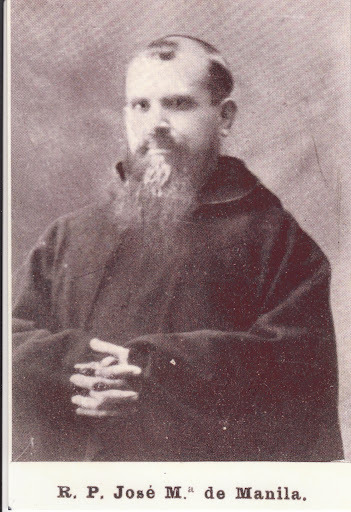 One of those beatified is a Spanish who was born in the Philippines, the Capuchin martyr Blessed Jose Maria de Manila, born to Spanish parents in Manila. His father was the last Spanish mayor of the City of Manila and received his education at the Ateneo, Letran and UST, all of which then were located in Intramuros. Mumblings in the Sacristy: Liturgical expert berates a newly ordained! After seeing photos of a young, newly ordained priest celebrating the Traditional Latin Mass, he stormed the convent of the priest and arrogantly told the young priest "Is this your understanding of Vatican II"? Yes. For that liturgical expert, everything started with Vatican II, forget about the past and what was taught before. Yes, I find that weird because this liturgical expert likes to tell his students to always know that what we have now is the "pristine liturgy" as told by his students. 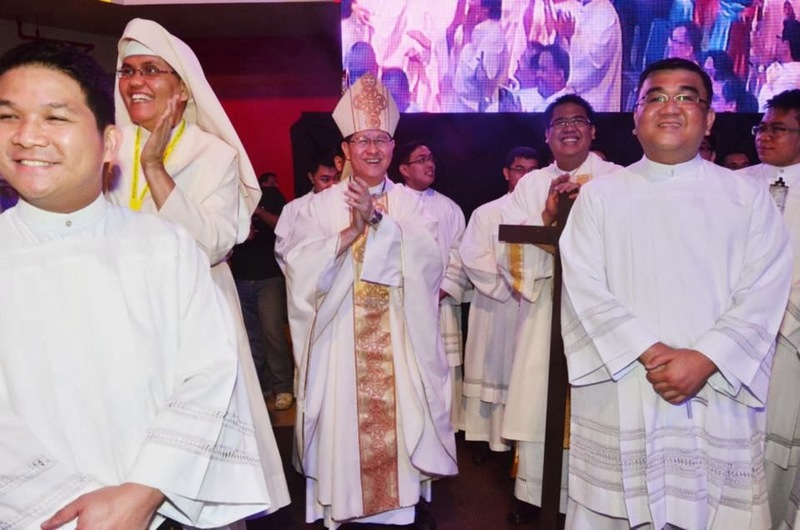 This liturgical expert is so full of himself, he thinks he can control every priest and every bishop of each diocese of the country just because he heads the Liturgy Commission of the Episcopal Conference of the Philippines. Yes, even some priests and even some bishops told me how pissed they off at this priest who thinks he can just arrogantly order anyone to tow his line when it comes to the liturgy, so pissed that one high ranking prelate said "He doesn't even have canonical basis for his arrogance! 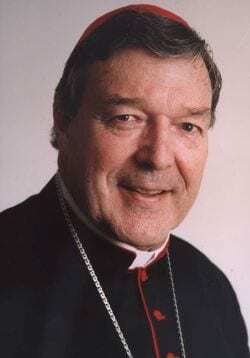 He does not have any authority to tell a bishop when and how he will celebrate the Mass, and most especially he does not have any authority whatsoever form whoever to tell a bishop or priest if he can or cannot celebrate the Traditional Latin Mass!" Yes, my dear folks. THIS IS AN EXAMPLE OF CAREERISM! The very thing that Pope Francis condemned. Poor guy never for once worked as a parish priest and he has the gall to act as if he were already a bishop! Ang Diwa ng Kayabangan ay Umaalingasaw hindi kayang itago. Para itong isang nabubulok na bangkay na hindi kayang itago! I noticed it too but did not mind it. Well, obviously, the Holy See does not want the name "IESUS" be spelled as "LESUS". So they are recalling the medals. The Latin language does not have a letter "J". The Holy Name of Jesus is spelled as "Iesus". This is the correct rendition, like how the Jesuits write it. BRAZEN THEFT OF THE BLESSED SACRAMENT!!! Nah. His name is not Robby Okol. It was a brazen, and blasphemous crime. A Catholic community in northern New Mexico is beside itself after a man burst into the adoration chapel at Sacred Heart of Jesus Catholic Church, and stole something very precious to them. The priest at Sacred Heart told News 13 this is the highest form of desecration he's seen. He made a plea to the burglar Tuesday afternoon before police arrested the suspect. It's meant for prayer, a place of peace, open 24/7. So, when a man walked into the adoration chapel at the Sacred Heart Catholic Church in Española on Monday afternoon, the two people in there praying couldn't believe what he did. "There is something so precious to us as Catholics that he has taken, and that is the Eucharist," explained Father Vitus Ezeiruaku, of the Sacred Heart Catholic Church. The suspect police later identified as Isaac Morfin, made a b-line for the monstrance, which holds the Eucharist, then ran out the door, dropping part of it in the parking lot. "We believe that Jesus is holy and entire in humanity and divinity, present in the holy Eucharist," explained Father Ezeiruaku. "So it means everything to us." Detective Solomon Romero of the Española Police Department said, ""We do believe that this individual may have been inside the chapel the day before, maybe looking at it or coming up with some sort of plan." One worshiper followed the suspect around the corner, but the suspect got away. Parishioners have had a hard time dealing with the crime. "It is not just the Catholic Church alone, but this entire community, not just the parish alone, but the entire community, who see this as a place of refuge," explained Father Ezeiruaku. "It's a small community, it's predominantly Catholic, it's extremely upsetting," added Detective Romero. On Tuesday afternoon, police conducted a search warrant, and arrested 39-year-old Morfin for burglary and larceny. "What he did is more than what he thinks, because he has touched the center of our belief, the center of our worship," said Ezeiruaku. Before the arrest, the priest made a plea to the burglar. "If he can find it in his heart to consider this community in pain and bring back what he has taken, I believe God's mercy follows him, and he will know the peace of God that he gives to those who say, Lord I am sorry." Española police told News 13 late Tuesday afternoon the stolen monstrance and the Eucharist were recovered at Morfin's home. The monstrance suffered minor damage. The Eucharist will be put back and the adoration chapel is still open. See the wisdom why there were communion rails before? And even though Vatican II did not mandate the destruction or removal of altar rails, they were removed for no apparent reason at all! All in the name of modernity and the alleged spirit of Vatican II! Again...contributing to the loss of the sense of the sacred. I hope the church does something drastic to prevent this theft, life putting the monstrance behind iron grates or glass doors, etc. This has been done here in some adoration chapels in the Philippines. If this guy is a Catholic, then he must make to face a church tribunal for his crime. But......will the OTHER guy who took home the Eucharist be disciplined by the Church? A new book by my favorite bishop on the Eucharist emphasizes the need to be aware of the great mystery and treasure we have right in front of us, in the tabernacle. If we only knew, then we would behave properly. 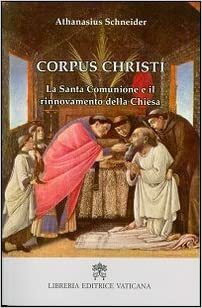 Vatican City, Oct 8, 2013 / 04:39 am (CNA/EWTN News).- Bishop Athanasius Schneider has recently published his second book on Eucharistic devotion in the hopes that it will foster greater reverence for the sacrament amongst the faithful of his diocese. Bishop Schneider, whose most recent book “Corpus Christi - Holy Communion and the Renewal of the Church” was published earlier this year, is the auxiliary bishop of Kazakhstan in Central Asia – a country whose religious population is roughly seventy percent Muslim, and thirty percent Christian. During the interview, the bishop expressed the great need to be more reverent in the way that the Eucharist is treated, explaining that the aim of both of his books is to increase respect of the Sacrament, especially amongst the faithful in his diocese. The "super-dogma" Sacrosanctum Concilium called the Eucharist the "summit and source of christian life". If that is so, then why we still have liturgical nonsense happening every Sunday and every Fiesta? Why we still have the circus every Sunday live on TV? I think we should all watch this. At the 13:56 mark, the great bishop called them "infidels". So much for ecumenical mushy kumbaya politically correct language, no? And so since we are aware of the Sense of the Sacred, we have this at our Sunday Mass, regularly. Check out the batallion of EMHCs. And the regular Sunday Tambourine Dancers. WE HAVE LOST RESPECT FOR THE HOLY OF HOLIES!